I got this sweater right before we went to Boston & it ended up being perfect for the weather there. It’s a thicker material & is pretty warm (a little itchy tho!) but it was nice for daytime w/the sun out. The fit is not the best – it’s a little short & maybe not the greatest fit but for the look, warmth, & price point – I really liked it! (Read this post for a softer version of this sweater!) While in Boston, I had tons of you recommend visiting Beacon Hill to take photos so that’s what we did – and it was so so beautiful there! We literally did everything you all recommended the most under one of my IG photos & loved everything! From the restaurants, to the shopping, to the sites, etc. – it was all so dreamy and so fun. Boston is definitely a place we’d like to visit again. John and I were talking about how it’s one of the cities we would enjoy living in – which is kind of rare for us. We love low key, smaller cities [basically more of a slow paced life style for day to day] but of course love traveling & visiting larger cities. However at one point we looked at each other and were like “this is totally one of those larger cities we could so live in!”. There’s something about Boston that is so different. Now I am really wanting to visit Cape Cod as well! Okay, totally rambling. Just FYI – I moved the Louis Vuitton wallet giveaway end time to 5pm TODAY. It was going to end at midnight last night and my blog got bogged down w/traffic and some couldn’t log on. But, everything is working now. I will announce the winner in Thursday blog post and I will also have a really fun giveaway Thursday as well. ALSO! I got tons of requests for blog posts on GIFT IDEAS so yesterdays post was all about gifts for someone who is hard to shop for or “that friend who has everything”! Lol. So far the feedback I’ve gotten about it has been so great – so many of you have e-mailed me excited to have found gift ideas from that post. I’ve had requests for other gift guides for kids & men – so let me know if you have a specific gift guide request! I do not think i could handle the FreEzing coLd, snowy boston winters. The weather was gorgeous while you GuyS were there tho! Love your blog! I think you have the best style – always love everything you wear and wish I could buy it! Love all your outfits!!! Love baby luke too! Looooveee how the boots go well with the sweater!! 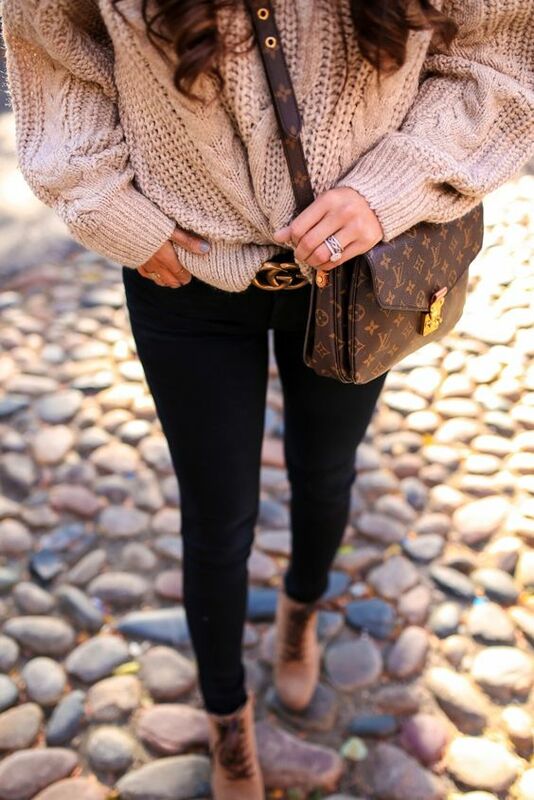 Such a lovely and comfy combo, your sweater is a perfect knitwear! Hooe you have a wonder thanksGiving! Love love love your blog. You never leave out a single detail! Keep kissing that Luke!! love your blog! can’t wait to recreate these looks for thanksgiving with my fam! That’s a gorgeous sweater! I actually like the fact that it’s a bit short, I think it looks nice tucked in (just like you did it). Such a nice sweater, gorgeous colour! Love this look! boston is an amazing city! I pLan to reLax this thanksgiving at a nearby hotel and enjoy A wonderful BuffEt. LOVE THIS SWEATER!! I have a similar one in ivory & maroon. Great idea on thE giveaway! More people should definitely follow your AMAZING blog! Plus its a huge blessing! Cant wait for the draw! beacon hill was DEFINITELY MY FAVORITE AREA OF BOSTON WHEN I VISITED FOR THE FIRST TIME LAST MONTH. I HAVE LIVED IN CLEVELAND, OH MY ENTIRE LIFE BUT I COULD TOTALLY PICTURE MYSELF LIVING IN BOSTON! SO GLAD YOU GOT TO SHOOT IN BEACHON HILL, AS IT IS GORGEOUS – ESP THIS TIME OF YEAR! THANKS FOR SHARING! Such a pretty knit sweater, can’t believe that it’s from H&M! Ahh are you on Union Park in the South end? One of the prettiest spots in the city! I love these boots on you, so unexpected yet so chic! I can’t tell you how much i enjoy your posts on fashion, beauty, and the recent Gift ideas. I am adding the Slip Silk pillowcase to my list for Christmas! I look foward to new postS from you. PLease do a post on what to get for teenage girls & boys! Less is more and better quality is what i stive to do when giving gifts. Another post on tHe best stocking stUffers! Thanks for shariNg all your good tips! Cape Cod is beauTiful! I’ve lived here 36 years with my husband and we raised our ch here. Many charming towns to visit and loVely beaChes! Summer is the time to come here but september is the niceSt month here. Come visit! Great combination of that beautiful sweater and that cool belt! I love your fashion sense, I just wanted to let you know that when I click the link to the boots it takes me to the page of ugg slippers, didn’t know if that was a glitch. btw keep up the good work, I look forward to your instagram posts each day.